It’s been something along the lines of eight years since The Scream team last played Toronto. That’s a long time for fans of the band. For me, it’s been even longer. Although I’ve fervently followed the eclectic musicians from album to album, and grown with them from genre to genre, I’ve never seen Primal Scream play live. The closest I ever got was when my brother, who was living and working in England a few years ago, regaled me with tales of one magical night that the band played the historic London Astoria. He paid over $250 Canadian dollars for the ticket, describing it simply as “a f**kin’ awesome” show. I missed Primal Scream when they toured their seminal acid trip album Screamadelica in the early nineteen nineties and I have regretted it ever since. Like many, that particular album opened me up to a completely new type of sound – trippy head music and dub-infused meanderings that expressed themselves many-a-night on the sweaty and alcohol-soaked dance floors of Toronto’s club scene. The album became a musical backdrop to my first few years of university life, informing both my listening habits and my late night socializing. The prevalent philosophy of the album: introspection, illumination and freedom (albeit via the use of illegal substances) was adopted in a personal outlook on life through both my thinking and my writing. No, I never hit the drugs, but the many sleepless nights of revelry eventually did take their toll. Still, “Higher Than the Sun” remains one of my all-time favourite songs. In the middle of that same decade, it was blues and American-styled rock’n’roll that influenced the album Give Out But Don’t Give Up and I could be found shaking my hips, stamping my feet and nodding my head to “Rocks” under the influence of strobe lights and tequila shots. I wasn’t the only one. Here, Primal Scream showed that they had musical interests outside of Ibitza and rave culture – and that they could play a mean guitar. A little older and a little more politically aware, the turn of the millennium Xtrmntr album came at precisely the right time. Once again, Primal Scream forced me to re-evaluate what my expectations of music were as well as make me consider what kinds of music I could (and would) enjoy listening to. A heavy, dark album, it borrows as much from punk as it does the industrial sounds of Europe, imbued with a nihilism that swarms and hammers the listener while never once losing a sense of musicality. This was echoed in 2002’s Evil Heat, which I listened too constantly at the gym. Robert Plant’s harmonica on “The Lord is My Shotgun” got me through a number of sessions on the stationary bike – which I rode the hell out of. Last Tuesday night, at the Phoenix Concert Theatre in downtown Toronto, I finally got my chance to celebrate Primal Scream and their latest release, 2008’s electro-pop infused Beautiful Future, with a crowd full of adoring fans. These days, I make an concerted effort to study the crowd at concerts, looking for familiar faces from the clubs and concerts of the past and wonder how these people I once saw on a regular basis grew up, what occupation they might currently hold, what their family life might be like. Occasionally, I’ll actually spot someone I recognize. Generally, these people have a little less hair and, perhaps, a little more pudge around the belly. At the Scream show, for the first time, I noticed something else: walking past me were concert-goers wearing military-styled jackets or hoodies and baggy jeans or form-fitted dress shirts and thin ties. On their feet were running shoes or Doc Martins or desert boots. Their hair was cut short or left long or even styled mop-top. I realized that as I had grown up with the band, their various albums of differing influences had reached out to a variety of audiences and had brought once disparate groups together through a unifying “Primal Scream” sound and philosophic aesthetic. Regardless of our various interests, the crowd had at least one thing in common: we had grown up, all of us, with an acceptance of differences, be they music or style or attitude or scene. Primal Scream is, musically, one of the most important bands of the last two decades and perhaps it is this last observation that they should be most celebrated for. 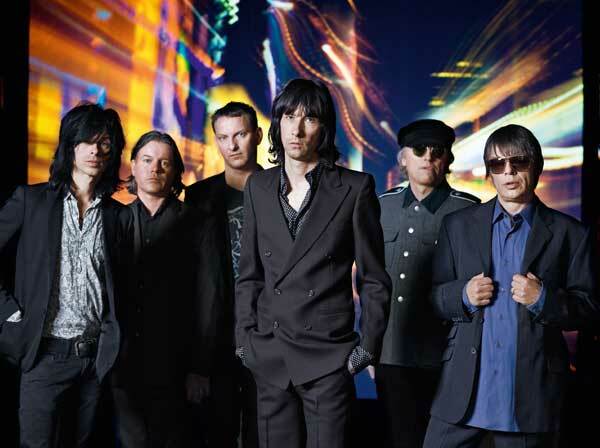 Primal Scream and I, along with all their other fans, continue to grow, certain to accept change in music, in people, in philosophies and certain to have a beautiful future together. Previous Post Previous post:Ian Rogers’ Oceanic Update: The Dharma Initiative Wants YOU! Loved the album Xtrminator…Kevin Shields being involved was enough for me.